This article was written in collaboration with Thom. I cannot think of a single application or website that has improved my daily work processes more quickly and effectively than Dropbox. Dropbox combines elements of many different applications: SVN, WebDAV, online storage, network storage, music and file sharing, FTP, Flickr, and Google Docs, just to name a few. And it manages to do so with style and simplicity. It is non-technical and seamlessly integrates into my normal working environment. 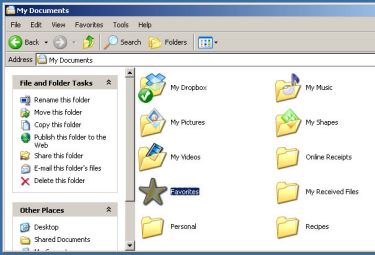 Initially, Dropbox quickly addressed the hassle of trying to work on the same files among multiple computers. I have long been tired of e-mailing files to myself, manually uploading files to a server, or transferring files using a flash drive. Dropbox allows me to bypass these now archaic file transferring options. Dropbox is currently in a beta stage, which means that for you to use it, an existing user must send you an invite or you must sign up on the wait list, then receive an invite from Dropbox itself. At its core, Dropbox is a file sharing application / service. At the time of this writing, there is a Dropbox client program for Mac OS X and Windows, and there is a Dropbox web interface. “Client program” might not be the best name, since what it does is designate a specific folder on your computer to be the Dropbox folder. You don’t have to interact with a program â€“ you can simply put all of the files you want to work with in this folder and the program does its magic in the background. There is a Linux client in the works, but I have no idea when that will be released. Since I work with both OS X and Windows, this cross operating system availability is a huge plus. Once you receive an invite to Dropbox, you create an account on the Dropbox website. Through this account, you can manage your Dropbox service. You can upload files, create shared folders, generate links to files in your public folder, and “share the love” by inviting your friends to Dropbox. 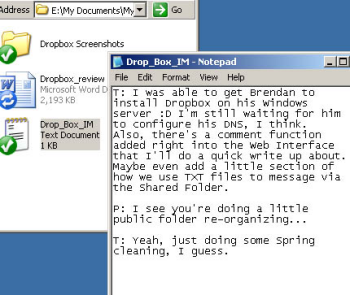 If Dropbox was only web-based, it wouldn’t be so impressive. Luckily for us, it isn’t. 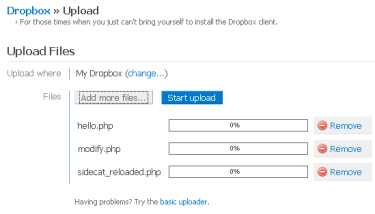 From your account, you can download and install Dropbox onto your computer, and link your account to it. Once that’s done, the magic begins. You can simply put any files into the “My Dropbox” folder. It works the same as managing your files within your “My Documents” folder. 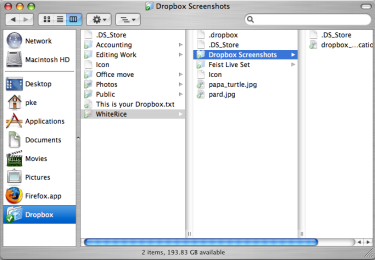 In fact, the Dropbox folder is installed into the “My Documents” folder (or the equivalent Mac folder) by default. Any file that you drop into your Dropbox folder automatically uploads to the remote Dropbox servers and you can access it from your account using a web browser. You can download and install Dropbox to as many computers as you like and link it to your account. Once that’s done, any changes to the Dropbox folder are automatically reflected on all the computers on which you have Dropbox installed and linked to. Complete synchronization. From this description, Dropbox might not sound that great, but to fully illustrate the awesomeness of Dropbox, I must describe each of the ways I use it. With Dropbox, you simply drop a music folder into the “My Dropbox” folder and you can access your music files easily from any computer you have Dropbox installed on or through a web browser. To share your music with other Dropbox users, you can simply drop the music folder into your shared folder (more on that later). To share your music with the rest of the world, you can drop your music into the “Public” folder and send the world a link (not recommended if you want to avoid a lawsuit). There are other music services, such as Muxtape, that allow for a more public form of music sharing. However, if your objective is to listen to your files privately among different computers or share music with a select group of friends without any uploading / listening / file format limitations, Dropbox is the clear winner. 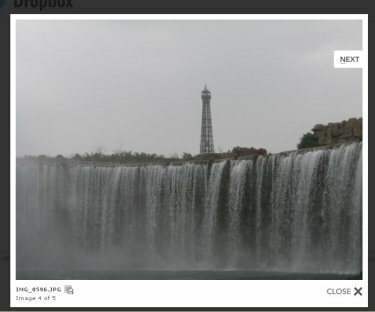 Dropbox has a slick photo gallery. There is a “Photos” folder under the main Dropbox folder. Any picture files put in the “Photos” folder are automatically available via a photo gallery. If you create sub-folders, each sub-folder is a separate photo gallery. There are probably thousands of file sharing websites. The usual process on one of those sites is that you use an upload form to manually put the file on the public server. Dropbox has a “Public” folder under the main Dropbox folder. There is a public URL available for any of the files placed in this folder. 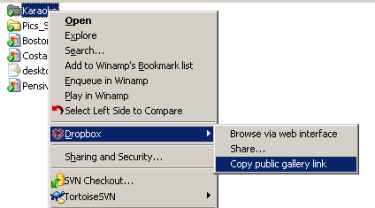 Simply place the file(s) you want to share in the “Public” folder, wait for the files to sync with the server, then copy the public link from the context / right menu. You can then share that link with your friends, family, and colleagues without having to deal with attachments or file sharing sites. Suppose I do work in the morning on my home computer. I save my files, and head to the office for the afternoon. 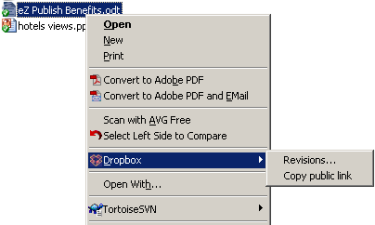 Once I boot up my work computer, the files that I had added or updated from my home computer are automatically updated on my work computer’s Dropbox folder. I can pick up where I left off, never having to worry about having multiple, out-of-sync repositories. 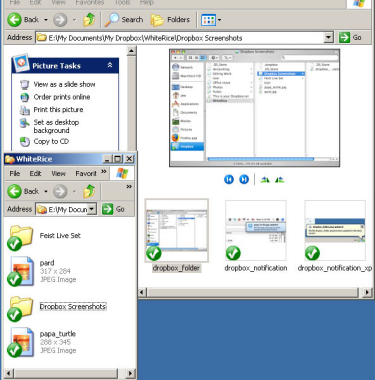 While the Dropbox client is easy to install on multiple computers, sometimes you will encounter a point where you have to use a public computer or someone else’s computer. In other words, you cannot install the client or it’s not practical to install it. 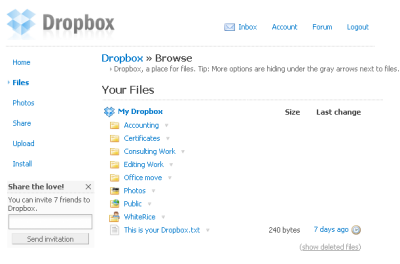 You can still access your files by logging into Dropbox’s web interface. The next time you access one of your computers with the Dropbox client installed, the files will be added or updated. Whenever you update a file in your Dropbox, the revision is noted. You can view the history of your revisions and, if desired, restore the file back to its previous revision. Similarly, if you delete a file and decide that you want it back, you can restore it. When browsing through your Dropbox in the web interface, you can choose to show deleted files. You can restore any of the deleted files (like restoring files from the “Trash” or “Recycle Bin” on your computer) or remove them completely. 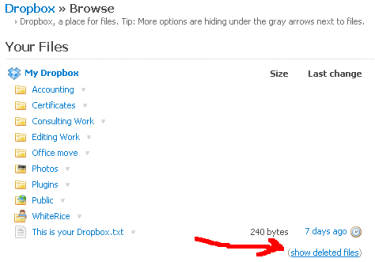 Once you click on “Share”, your browser will open the web interface for your Dropbox account. 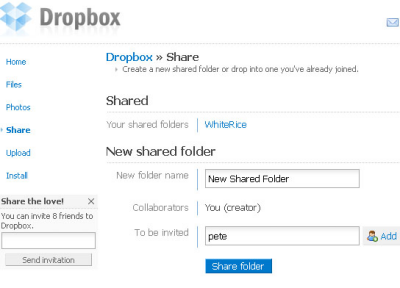 From there, you can invite other Dropbox users to partake in your shared folder fun! While creating a new shared folder directly from the web interface is better if you’re creating a brand new folder, the first method allows you to make any existing folder into a shared one. From the invitees’ end, they will receive a notification in their inbox about the invite, which they can choose to accept or decline. 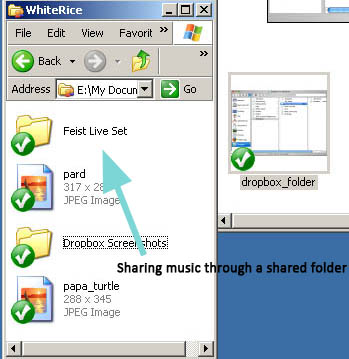 Whoever creates the shared folder has administrative control over it, and can invite or kick out users as he / she pleases. 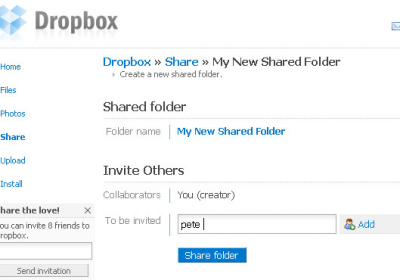 Invitees, or “collaborators” as they are called in Dropbox, are able to invite friends or leave the folder. Once your shared folder is set up and the appropriate people are invited, sharing files is a joy. This article was written by two people sitting at opposite ends of the country with the help of Dropbox. In a shared folder described above, we outlined this article, drafted it (in a word processor), saved screenshots, and even sent a few messages back and forth about the article (by using text files to contain messages). 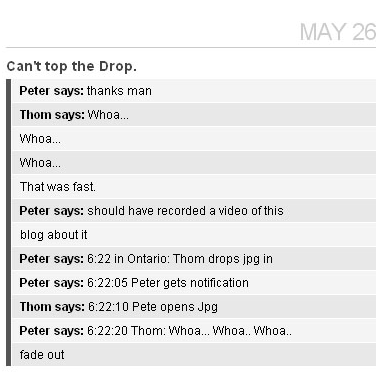 Whenever one of us uploaded or updated a file, the other party was almost instantly notified. While we couldn’t work on the same file at the same time (a bit impractical unless you are working on a standard format such as in Google Docs), we had one Word file in the Shared Folder and took turns adding and editing the text in it on our own time. Dropbox took care of the automatic updating and notifications on each end, no cumbersome IM file sending required. By no means is Dropbox intended to be a messaging solution, but there is a built-in messaging function that allows you to leave messages to your collaborators in the Shared Folder. This keeps all messages about updates, feedback, or general thoughts available within the folder that you’re collaborating on. Once you add a comment, it sends an email out to all the collaborators informing them a comment was added. You can also employ a makeshift messaging system by creating a text file in a shared folder. The text file is ideal as opposed to another file format because it is quick and simple, and can be viewed directly in a web browser if needed. After adding a new message in the text file and saving it, your collaborators will get a notification that the file has been updated, which essentially means that there is a new message. There are obviously more efficient ways to sending instant messages, but the methods described above allow for messages to be sent when you cannot reach a collaborator through an IM program, such as MSN, or if you want the messages saved in some form of repository. It’s also faster than sending an email or replying to one. As a Linux client is upcoming, it would be handy to install the client on a server in order to sync and work on website files, eliminating the need to use FTP, SSH, or SVN clients. This can also be done on a Mac OS X or Windows server (I’ve successfully tested this) by using one of the sub-folders under your Dropbox folder as the “pub_html”, “httpdocs”, “www” or similar folder. Currently, new Dropbox beta users receive two gigabytes of storage space to hold all files, revisions, and deleted files. This is plenty of space for your document, music, and picture needs. It is not enough if you are sharing large videos, but to make good use of Dropbox’s speed and efficiency, use something else for such needs. Even though you run the risk of a remote server crapping out and losing your hosted files, there’s little worry since everything is always backed up on your local machine, or machines (assuming, in a worst-case scenario, that you can disconnect your computer before it syncs with an empty dropbox account by deleting every file). And if you have shared folders, there will back-ups of the files on each of your collaborators’ machines. However, if you wanted to access files through the web interface if the servers go down, you’re SOL. But that’s a risk I’m more than willing to take. Dropbox is currently free for everybody, but it will probably also offer premium, paid accounts with more storage and features when it is officially open to the public. I have been so impressed by it so far that I think an account is worth a few dollars per month even for its current offering. Yeh Dropbox simply is awesome probly the best utility that I have found so far! If nothing good shows up for .Mac at the WWDC on June 9th then Dropbox will have officially replaced my iDisk. Just so you know, their CEO told me that they will add web 2.0 feature to read audio and video files on the go from the web interface later. Dropbox should probably hire you, just based on this description/review! Personally, I’ve been waiting years for something this clean. Absolutely top drawer. Thanks for showing me this nice tool/website/program.. Will be useful!! Thanks again, keep the good crap coming! Good article. Where was this program when I was still in school! How did you first learn about drop box? I hope they keep a good sized capacity limit for their free users, the more adoption of this as a standard program for many users, the more use this program will have as you can easily share documents etc between each other. I’m currently using rsync to sync my separate machines which is a pain. Any word on the cost structure for home and business? email is trendstarusa@yahoo.com. Please invite. wish 2Gb ups to 5Gb, at the least. Would love to trial the service. Any idea how I get an invite? Therefore, you’ll either have to sign up to be a beta tester on the website and then wait a couple of weeks OR find another current user who has invites. Somebody throw me an invite when you get a chance!
! The link to dropbox in the first sentence is busted. It links to http://www.getdropbox/ instead of http://www.getdropbox.com. Thanks for pointing that out, JK. I’ve now fixed the link. Not to divert attention to another service, but for those of you who can’t get an invite check out www.syncplicity.com . It’s a free beta service open to the public, and offers similar service. I currently have both that and Dropbox running and am testing out both. I’m not yet sure which one I like better, but as they approach release I will probably post a dual review somewhere. Thanks for the tip, Dave! I just watched the overview video and Syncplicity is also quite neat, with extra features such as Google Docs and Facebook photo integration. The downside is that it currently only has a Windows client. Still, it’s something to keep an eye on for sure. Dropbox launched the other day get it while it’s hot. 50 GB $9.99 / month or $99.99 / year. excellent, Your post is very useful and resolve my problem. I will use it, but your storage space is very limited. You need to increase it. If you could make 3 GB for free version that will make more popular. Let me try it and if it is successful then i will purchase a whole year package. So how does one get invited? Thx!!! 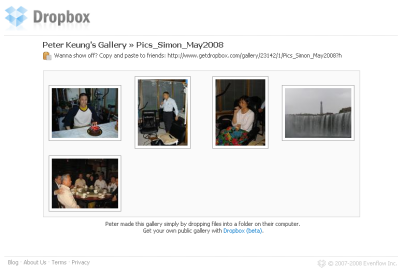 Reply from Peter: You no longer require an invite for Dropbox. Anybody can sign up! Has anyone found that it is invasive to your operating system? My boss hates it and doesn’t understand why Growl is automatically downloaded when dropbox is downloaded? I love it and I am trying to convince her it is the best thing for our company. Any tips or answers as to why this would have happened? Is this system truly invasive?